I'm feeling full of gratitude on this Thanksgiving Day. I'm grateful to the forecasters for being completely wrong about the nuking tradewinds they predicted today. And to Dorothy for sparing me this morning when I joyously realized their error. And to Thom for putting off dealing with his tenant's bedbug problems to join me out there. I flew by myself in perfect light north conditions for about an hour, top landing to wait out the first squall that had blossomed in front of the bay. The squall mainly hit the Kaaawa side, and as I waited for the wind to fill back in, Thom hiked up to join me. We got some wind and I launched again, only to spot another squall lumbering into the bay. 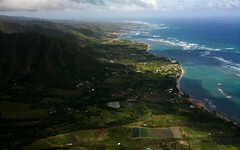 I top landed again, and Thom and I watched it slip by to the Punaluu side. The wind really died off in its wake, blowing super light and super east for a while, with disconcerting offshore cycles. But after a while the breeze came back, strong and east now, and we both launched this time, soaring the ridge for a while, before finally landing to head home to our very tolerant families. Once again I was able to shoot some footage with my phone and upload it here for your amusement. I didn't get as many good angles as the previous time but I thought some of the clips were nice. It's just too easy to make video this way! Whew, I'm having some technical issues with my video. First I uploaded it without saving the audio track, so it's completely silent. The "Good to be King" joke doesn't make any sense without the soundtrack! Then I saved it with the audio and uploaded again, but I somehow uploaded the same copy AGAIN. So now I'm uploading the correct version, my third try at this. So much for how easy it is to share these little video projects! Alex thanks for the video, felt like I flew today too. Any time just call, if can will, if can't will try.